IF SHARED OUTSIDE OF THIS SITE I WILL REMOVE THIS POST AND NEVER REUPLOAD! This plugin provides Search Engine Optimization (SEO) for Title, Description, Keywords as well as customized additional headers for SE standard pages. It also support XML sitemap file building for your site contents including core site map menu urls, user profile urls, and popular plugin page view urls via site map channel API. Easy submit sitemap to major search engine like Google, Bing thru Update Notification (ping) etc..
Support override any title and set any META description and any META keywords you want for standard SE pages. Support dynamic subject (item/object) title, description, keywords, and subject's owner user's display name replacement for page title, description, keywords. Many different output formatting for page title, description / keyword meta tags such as Prepend, Append, Override mode to global site title, description, and keywords. Task scheduling for auto-build and update notification. 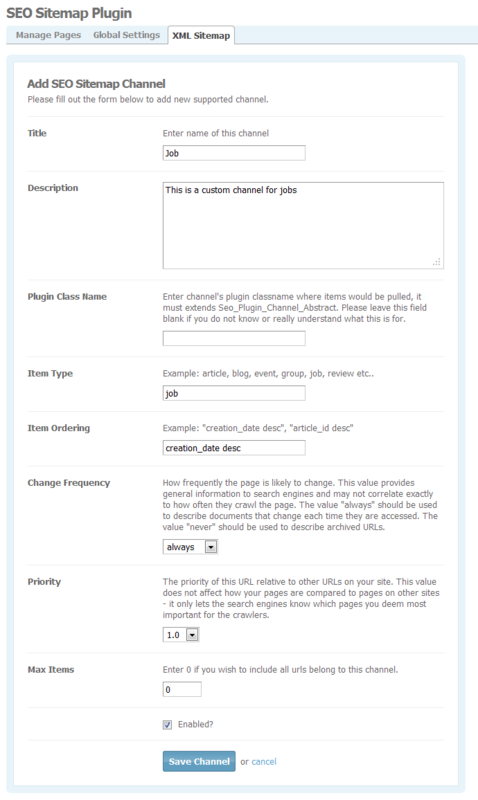 This plugin has interface to add custom channels for 3rd party plugins very easily. 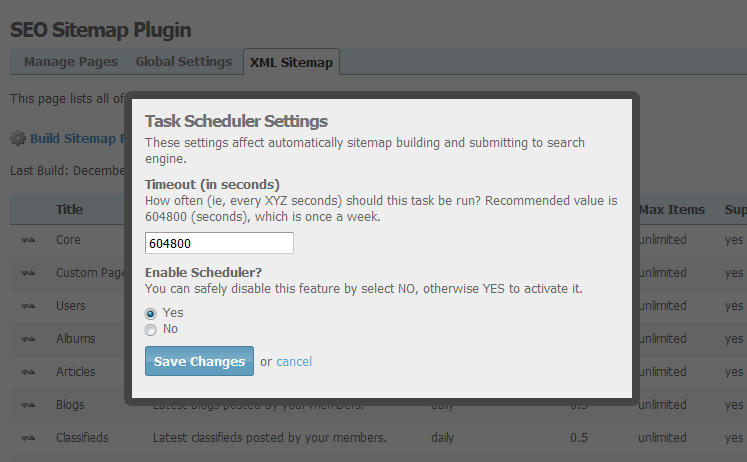 This feature makes SEO / Sitemap a very flexiable, extendable, and customizable plugin. It comes built-in with support for all SE official plugins, as well as popular Radcodes plugins. NOTE: The plugin does not make any guarantee on the search ranking placement of your site. The ranking position is up to the search engine, which no one really have control over (unless you pay to be on top etc..) For the Sitemap part, the main job of the plugin is to "generate the sitemap" of links on your site for you, so that you do not have to do it manually (imagining create a sitemap with thousand of urls yourself). 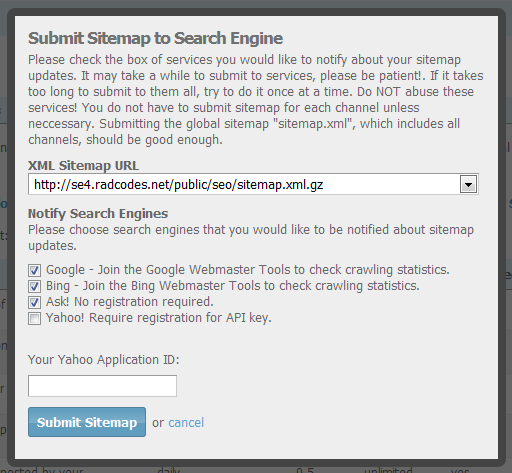 It also (optionally) help you submit that sitemap to the search engines, so that you do not have to manually do it. Submitting a site map does NOT guarantee that it would have good or bad effect on your site placement in anyway. 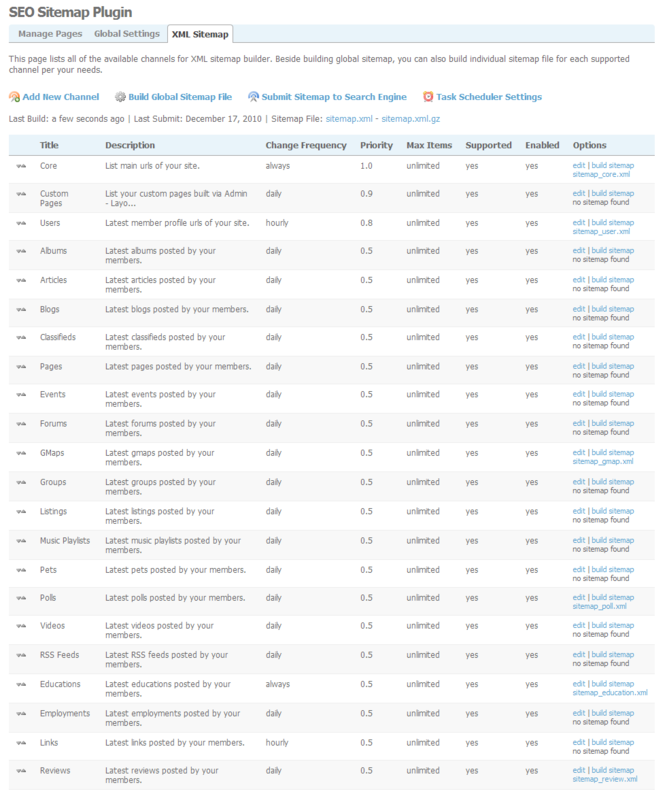 Sitemap XML helps search engine bots find pages on the site. If you have question about placement / ranking position of your site, you should contact search engine or SEO firm for full analysis regarding using title, description, keywords that work best for your site content. Below is the direct quote from WikiPedia, you can learn more about site map on Sitemap Wikipage. 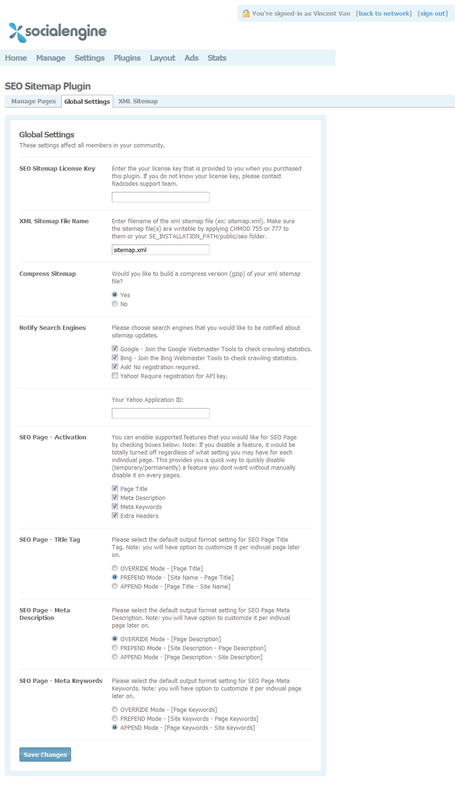 USE SOCIAL ENGINE PACKAGE MANAGER AND JUST UPLOAD THIS ONE FILE! ENJOY! PLEASE PLEASE NOTE THIS ISN'T THE LATEST VERSION OF THE PLUGIN BUT A PERFECTED AND WORKING VERSION. I HAVE FIXED ALL OF THE BUGS, REMOVED YAHOO AND ASK BECAUSE THEY UPDATE TOO OFTEN SO THE PROTOCOLS JUST NEVER WORK! This is an updated version of the one that i posted in the premium section, Mod if you want to move it there go for it! Edited by Speedy, 01 July 2015 - 11:37 PM. SEO is something everyone can definitely use so it will remain here in the regular nulled forum. Fellow members, please like this post if the module works for you and you are able to utilize it. It is a way of showing gratitude for the share. THANKS! Does anyone have a link to a help file/ How to basically set this up? No one knows how to use it?